As the story goes, Joseph was talking to his traitor brothers. The “harm” (bad things) that befall us come from different sources but what is more important than the source or what the “bad things” are is GOD INTENDS THEM FOR GOOD. 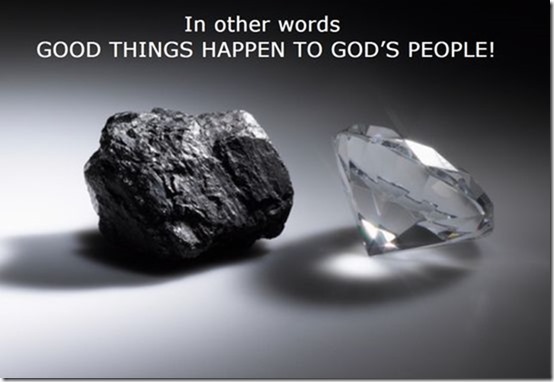 In other words GOOD THINGS HAPPEN TO GOD’S PEOPLE! For me the best example not only of good things happening TO (Jesus) God’s people but also good things happen FOR (us) God’s people is illustrated in the Resurrection story. Which basically is a bitter to sweet story, a death to life story, a bad to good story, a coal to diamond story, Jesus’ story our story, a God to people story. Have you ever heard the story about a man who had been ship wrecked on a small island for nearly a year then one night his hut caught fire. Wondering what could happen next to him he fell asleep only to wake up the next day to a rescue party who had seen his signal fire. You can easily give the man your name because at some point in your life that’s happened to you. God saw your signal fire (some seemingly “bad thing”) and used it to solidify your relationship with Him. Your relationship with God is the ultimate good thing (blessing).